There are multiple ways in which engineers can design coil springs. Some clip the end of the spring "square." This creates a small high-pressure point at the end of the spring, which transfers load eccentrically. Other designers prefer to bend the last coil to make it perpendicular to the axis or shave the last coil at the pitch angle. This helps spreading the load over a large area. Pressure distribution can be accurately measured in each of these designs. Determine the pressure distribution between a coil spring and support that enhances longevity, performance and properly balances load. I-Scan™ pressure mapping system can measure pressure distribution. 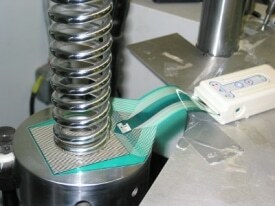 The system's sensors intrude minimally and can measure the contact area of the spring by being positioned under the coils. They can also measure the changes that occur in the contact area or the pressure distribution that occurs during the application of various forces. 2D and 3D displays of the pressure data are available and can be used in the comparison of coil spring designs during simulated operating conditions. Tekscan offers patented, reusable, thin-film sensors, which are available in different shapes and sizes, and provide accurate contact pressure measurements. High pressure on the outside of the loaded spring is illustrated by the 2D output of the coil spring. Force vs. distance graph showing higher forces on the outside of the spring. Force vs. time graph showing consistent force over the duration of the test.